Baseball. Apple pie. The Simpsons. There are few cultural artifacts that are more universal in American culture than The Simpsons, the ubiquitous animated program and longest-running sitcom in U.S. history. The series isn&apos;t just known for its longevity but its depth as well. Despite giving rise to a variety of foul-mouthed animated offspring — Family Guy in particular comes to mind — the FOX series has always displayed an appreciation for culture and, in turn, sought to critique the idiosyncrasies of American culture. At its prime, the series was so sharp that a whole catalogue of academic works have been devoted to unpacking the nature of the Simpsons&apos; role as a mirror for American life. The series&apos; reverence for literary creativity was on full display this week when the it paid tribute to the victims of the Jan. 7 attack on Charlie Hebdo in Paris. 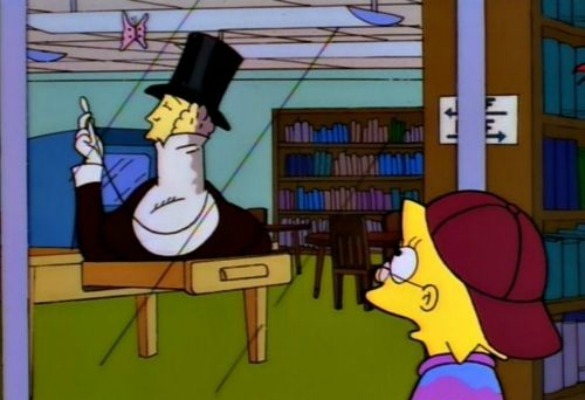 In appreciation of this, Lapham&apos;s Quarterly editor Michelle Legro and I created the Lisa Simpson Book Club, a single-serving Tumblr devoted to the best literary references in the show&apos;s history, with a focus on the bookish middle Simpsons kid. Below, a selection of some of the series&apos; best literary shout-outs. Marge: "Did you invite one of your friends?" Lisa: "Friends? Ha! These are my only friends: Grown-up nerds like Gore Vidal. And even he&apos;s kissed more boys than I ever will." Marge: "Girls, Lisa. Boys kiss girls." Including: "Sasha and Malia on the Allowance Deficits." In the new comic book store, Coolsville Comics & Toys, Lisa reads Tintin in Paris. This album does not exist in the Tintin series but is a mishmash of the cover of Tintin in the Land of the Soviets, the island from The Black Island and the rocket from Destination Moon. Homer: "Hey, why didn&apos;t you tell me the new issue of &apos;Weird&apos; was here!" Plimpton, editor of the Paris Review, welcomes Lisa and her fellow competitors to the 34rd Spellympiad — before bribing her to take a dive with the promise of free college and the George Plimpton Hotplate. Lisa: "Miss Tan, I loved The Joy Luck Club. You really showed me how the mother-daughter bond could survive adversity." Tan: "No, no, that&apos;s not what I meant at all. I can&apos;t believe how wrong you got it. Just sit down, I&apos;m embarrassed for both of us." "It&apos;s Tom Wolfe! He&apos;s used more exclamation points than any other major American writer." Lisa: "What&apos;s the point of getting rid of all the distractions at home if I have to do my learning here?" Lisa: "This is the last time I bring these two to bed at the same time." William L. Shirer once said his history was meant to be read in repose. Lisa begs to differ. Lisa&apos;s always had a soft spot for Shaw. Lisa consoles a beached whale with Leaves of Grass: "The world below the brine; Forests at the bottom of the sea — the branches and leaves, sea-lettuce, vast lichens, strange flowers and seeds." New Yorker mascot Eustace Tilley shows up in a later episode: "We have periodicals on microfiche!" In which actor Christopher Walken reads the book to some terrified children. Lisa: "Ms. Rowling, I love your books. You&apos;ve turned an entire generation on to reading." Rowling: "Thank you, young Muggle." Lisa: "Could you tell me what happens at the end of the series?" Rowling: [Exasperated] "He grows up and he marries you! Is that what you want to hear?" Chabon: "You can&apos;t make this stuff up." Chabon: "That&apos;s it, Franzen! I think your nose needs some corrections!" Lisa: "You&apos;re reading Gravity&apos;s Rainbow?" While investigating the shooting of Mr. Burns, Chief Wiggum consults Ten Trite Tales. Homer: "Marge, did you know Indonesia is at a crossroads?" Artie Ziff connects with Lisa over some delicious Franzen. When Marge started at college, she read A People&apos;s History of the United States while Homer watched Seinfeld. The look of the Simpsons&apos; neighborhood transitions wildly when new neighbors discover a forgotten Neutra, triggering a renovation craze. Their project is so successful that it&apos;s featured on the cover of Dwell. "All of J.D. Salinger&apos;s books, except Catcher in the Rye!" Mr. Bergstrom read Charlotte&apos;s Web to Lisa&apos;s class: "Nobody, of the hundreds of people that had visited the fair, knew that a grey spider had played the most important part of all. Nobody was with her when she died." Because of course Krusty reads the FT.
Lisa enjoys the famous Franco-Belgian comic. "Well, I think we should invest in a set of The Great Books Of Western Civilization. Look at this ad from The New Republic for Kids: Each month, a new classic will be delivered to our door. Paradise Regained, Martin Chuzzlewit or Herman Melville&apos;s twin classics Omoo and Typee." Not a real magazine, but boy, do we wish it was. 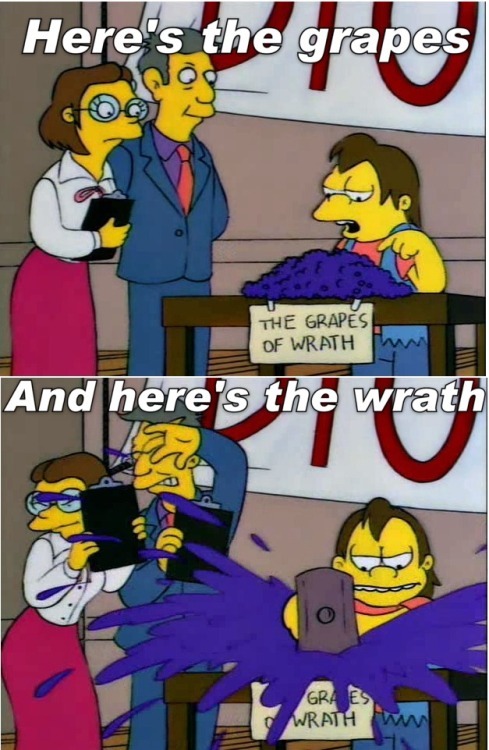 In "The Front" (Season 4, Episode 78), Lisa reads How to Get Rich Writing Cartoons by John Swartzwelder, writer of the largest number Simpsons episodes.